What is the best flooring for dogs? What is the best flooring option for a puppy? 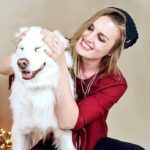 Best flooring for large dogs? Best flooring for a senior dog? There are many things to take into consideration when you own a dog, and one – which is often overlooked – is the best flooring for dogs. You heard right, the floor matters, especially if you are planning to remodel parts of your home. In these cases, you might as well choose a material that benefits your furry friends, as they are the ones that will spend the most time being close to the ground and to the floor material you pick. You might find yourself on the floor when cleaning, looking for a lost sock, when playing with your pup or when reaching down to pick up something you’ve dropped, but dogs stay down there all the time, which is why it is important to find the best floors for dogs in your family. The ideal floor for a family with dogs is one that benefits both human and dog, and that resists scratch marks from your pup’s nails while also providing traction. So, what kind of floor is best for dogs? Whether you are considering the best Pergo flooring for dogs in your household or the best hardwood floor for dogs and cats living under your roof – your best bet is to do your research before making your decision. Let’s have a look at the first option when looking for the best type of flooring for dogs. Vinyl dog flooring is not what it used to be, and it has improved greatly over recent years. You can now find great looking quality vinyl for a very low price, which is one of the best things about this material! The options are many, and finding the best vinyl flooring for dogs and their human family members is actually quite easy. 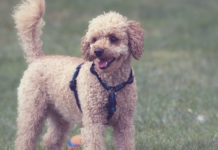 It is a budget option that does not have to look cheap, and it prevents your furry friend from slipping and sliding (and potentially hurting themselves) as they roam around the house. Looking for the best laminate flooring for dogs? Materials like laminate are incredibly scratch-proof, and your dog can run around all he wants – even with long nails that require clipping down – without risking scratching it or in other ways damage it. This makes laminate flooring and dogs a good combination. Such a guarantee is a relief for many dog owners, especially when renovating a room since nobody wants to spend time and money on something that does not last. Laminate flooring for dogs is not great with moisture, but it makes up for this flaw with its scratch resistance. The downside is that dogs, in general, are not loving the feeling of walking on laminate flooring, and this, unfortunately, applies both to the shinier laminate flooring and the one that is matte. You can choose a thicker laminate floor type to reduce the clicking sound as the dog walks, but don’t be surprised if your pup seems reluctant to walk on it; at least in the beginning. Unlike laminate, tile is not damaged by water, and you can easily clean it with a mop, wipes or by pouring water over it, making tile options durable floors for dogs. 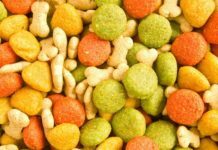 This is, of course, convenient when having dogs, as it is near impossible to keep even the best floor for dogs clean when you have muddy paws coming inside after a long walk or park run-around. Tile is a very solid flooring option; done with cement underneath, which eliminates that clicking sound caused by the laminate. It does have something in common with laminate, however, and it is that many dogs are wary of walking on the slick surface, due to lack of traction, which might not make it the best flooring for homes with dogs. This especially applies to older togs that are a little unsteady on their feet, but you can opt for tile with better traction to make this less of an issue. When producing bamboo flooring, resins are infused for maximum durability. This shows in its long-lasting features, and with a bamboo floor, you won’t have to worry about changing your floors again in a very long time. It is made with organic materials, like a wooden floor, and you can install radiant heating underneath if needed, but the material actually stays quite warm on its own during cold winter days. 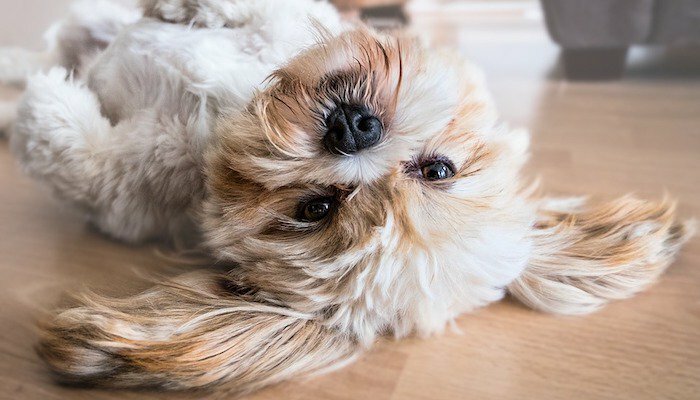 Dogs can walk on it just fine; without experiencing the possible discomfort of tile and laminate, and it is scratch-resistant enough to provide a solid option for dog-loving homeowners. A carpeted option has its pros and cons, as one might imagine, and the obvious con is difficult to clean. Vacuum cleaning with a cordless pet hair removal vacuum cleaner is the best (and perhaps only) way to keep a carpeted floor clean, but the real issue is moist and liquids. Dogs are messy, and if you have a young puppy that is not house trained yet, or an older dog struggling with incontinence, then carpeting might not be the ideal option for you. Alternatively, you can invest in a belly band for dogs. Carpets can be professionally cleaned, but it would be a hassle to have this done every time your puppy has an accident. The good thing about a carpet is that it provides your dog with a comfortable resting place (they can go to sleep anywhere in the room! 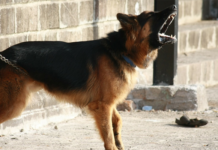 ), which might be extra desirable for dogs with a bone and joint problem, as well as pain. Hardwood flooring looks incredible in any home, but it does not do well with dog claws. A harder wood type will make the best hardwood floors for dogs, as they will naturally be more resistant to marks and holes caused by doggy nails. However, a harder type of wood will instead dig a deeper hole in your wallet. It is expensive, but possibly necessary if you want to combine having big dogs and a hardwood floor. A potential life-saver is that hardwood floors can be re-sanded quite easily and be made to look as good as new with a reasonable amount of effort. The best hardwood flooring for dogs will last fairly long, and if it does not – just sand it again at your convenience. Engineered wood floors are cheaper alternatives to hardwood floors, which can be made to look very similar without costing as much. They can however only be sanded lightly, and not several times like hardwood floors, which can be an issue when the scratches and the marks from your dog’s claws start to become too evident. Dogs very much enjoy wooden floors, however, so if your pup’s happiness is your number one motivation – go for it. After all, it is not the most expensive floor type, and the option of replacing it is there if you have the time and the financial means. If you have chihuahuas, your dog scratching the floor may not be a major concern due to their lightweight. If you, on the other hand, own 5 Great Danes, then perhaps you need to opt for a floor type that won’t get dented, scratched or in other ways ruined too easily (such as vinyl, carpet, and tile). For those with calm and slow-moving dogs, such as an older animal or one with a very chill personality, might not need to worry too much about a scratched floor either. 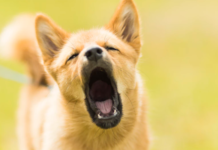 However, puppies and young dogs that like to run around the house at full speed are a lot more likely to cause damage, and owners of such rambunctious furballs may also need to consider a more resistant flooring material. Okay, so your dog is Mr. Calm himself, and never runs around or makes much of a fuss. You think flooring won’t be an issue, and it probably won’t, but what if you decide to get a new canine addition one day? A new dog, that might turn out to be a lot more energetic than your first. What then? Would you re-floor your home? Probably not, so take into consideration any future dogs that may or may not move in with you one day when you choose floors for dogs in your family. When choosing a floor type for a puppy or a young dog, it is important to remember that the pup will most likely have accidents for a while, until they learn to control their bladder and do their deeds outside. When looking for the best flooring dogs and puppies will love, choose a floor that is easy to keep clean; such as tile or vinyl, and avoid materials like laminate and carpeting, as these can be destroyed by moisture. 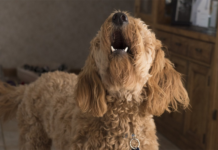 Choose a harder material like a hardwood floor made with a solid wood type or opt for vinyl or tile that does not dent or scratch when a large dog moves around. The best wood flooring for dogs any size are those made with the hardest possible wood, but keep in mind that it can be a bit pricy. A senior dog has a greater need for traction so that they won’t slide around as they walk, or struggle to get up after lying down. Carpeting is a gentle option for tired senior dogs’ legs as well as painful joints, but you need to remember that some senior dogs become incontinent with age, which could damage the carpet and make it difficult to clean. When trying to decide on the most durable flooring for dogs that are older, another good option is vinyl, or possibly a solid hardwood floor.